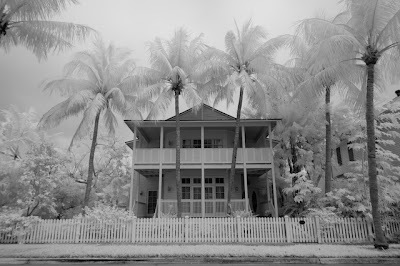 I had mentioned on an earlier post that I had converted my old back-up camera a Nikon D70 to Infrared. I am absolutely thrilled with the results. I did the conversion myself with the help of a tutorial from Life Pixel. 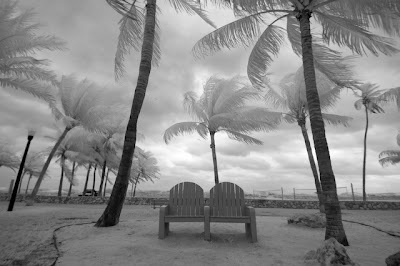 I read on their web site that the Nikon D70 was one of the simplest digital cameras to convert to infrared. I purchased Life Pixel's custom glass Infrared filter to replace the hotmirror I was taking out. You can read the whole process HERE. The whole process of the conversion took about 40 minutes, I did have to re-open the camera a few times to make a better connection of some of the electronics. One of the neat things about the conversion is that you no longer need to shoot through a dark Infrared R72 filter to produce an infrared image. 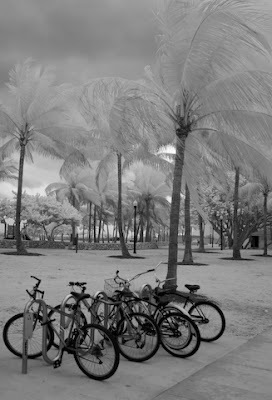 I use to use an older Olympus snap and shoot to shoot IR photos using the R72 filter method. You needed a tripod to shoot as the exposures where very long, often having to focus the camera before putting the dark filter on. With this new conversion the image in the viewfinder is clear as normal and you don't have the the density of the R72 filter to effect your shutter speeds. I can hand hold the camera or just have shutter speeds fast enough to freeze the movement of plants and trees from the wind. 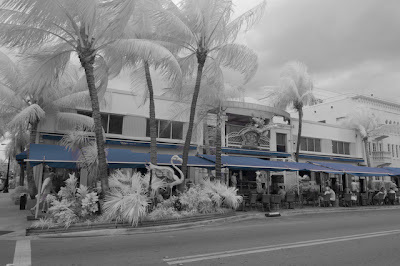 Here are a few more images from Florida. I look forward to winter ending here in Colorado so I can shoot more images. Erik calls himself a voice activated light stand when he's holding a strobe in this manner. 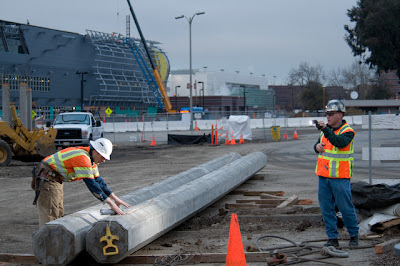 It was an overcast morning when workers started to work in the field at the San Jose, California Airport. 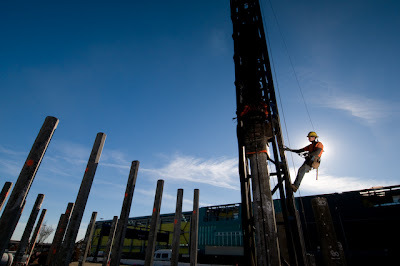 The movement around the concrete pillars was fast and less than stationary. 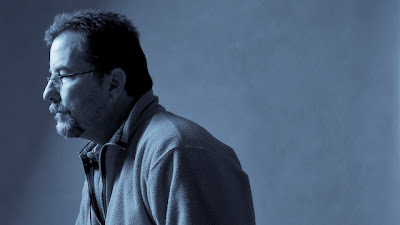 By having Erik move with the subject and keeping the same distance, I was able to place light where it was needed. Because of the loud construction taking place in the area, I decided to use the Nikon Command Unit SU-800 to fire the strobe. I was able to control the flash output from my position behind the camera. Here are a few images using the V.A.L.S. 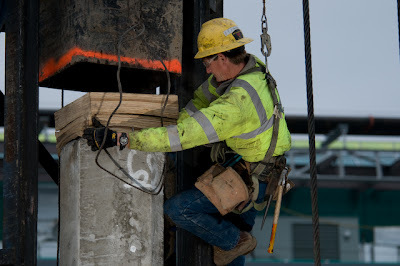 Erik was holding the strobe just below and to the left of the worker on the concrete pillar. 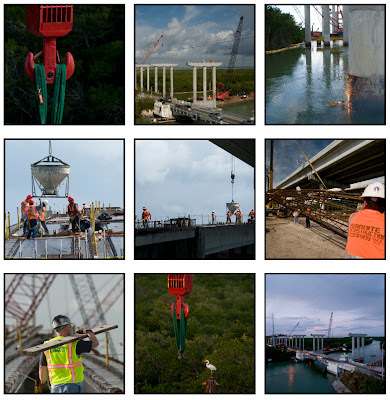 I was recently in Key Largo to photography the construction of a large bridge over Jewfish Creek. The current bridge was build in 1944, is 223' long and is of the old drawbridge style. When a boat to tall to pass under the bridge, traffic would be stopped and the drawbridge would opened to allow the boat to pass through. With as much traffic that travels on this highway (Highway 1 to the Keys)they needed a new bridge. I arrived in Miami about 8 hours later than scheduled, we had a mechanical on our plane for two hours before they (American Airlines) canceled the flight. We had to go back into the terminal, down to baggage claim and than to the counter for re-ticketing to our destination. Erik went to baggage while I headed to the counter for booking. We where set to Chicago first and than on to Miami. I had planned to be at the bridge to scout or even shoot sunset at 4 pm. As it turned out, we arrived at 2 am. I all the years I've been shooting, I've been very fortunate not to have many of these types of flight problems. The following day I had a full day of shooting the normal activity associated with this type of project. Concrete work, wielding, and various other activities. I also had weather issues to deal with, Florida is known for it's sporadic downpours which we had. 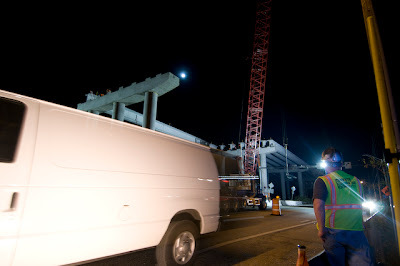 Later in the evening, about 8 or 8:30 pm, 3 large concrete girders where going to be placed on vertical supports. I had planned to lite the entire bridge with my 4 SB-800 strobes, prior to changes which I'll point out later. 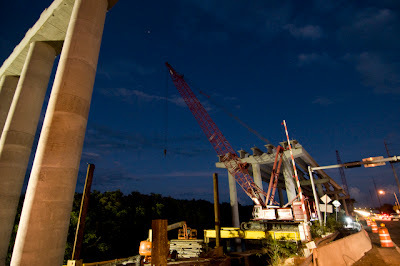 This photo was taken at 5:30 pm, about 2 1/2 hour before the first girder placement. I only wish they could have hung the girders at the time of the photo below. 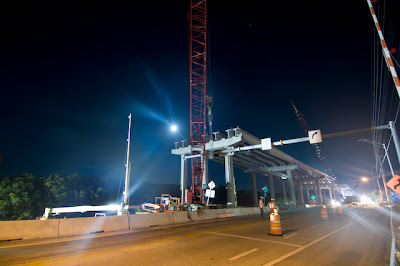 As soon as darkness fell, we began to test our lights and placement for when the girders arrive. 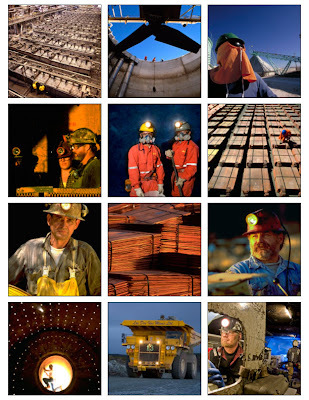 I wanted to be ready and prepared for the arrive of the girders. There was one large portable "Man-Lite" sitting on a barge in the water that provided some lighting which I had planned on utilizing along with my own lights. My first test with my flash is here. It was my thought that this strobe would light the underside of the girders being lifted into place as well as providing some lighting on the vertical supports on the left side. 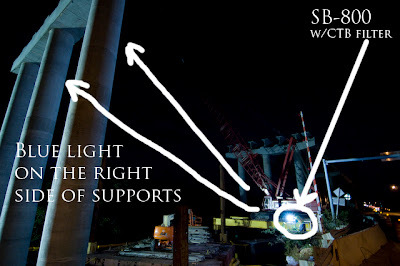 The light on the left side of the supports is coming from the "Man-Lites" on the barge. The next light we tested was further down under the already placed girders. 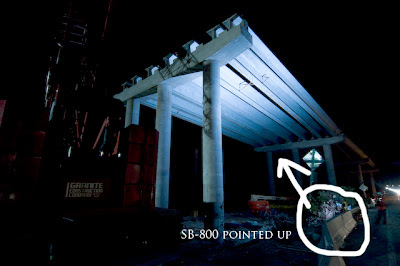 We had this strobe zoomed out to about 105 mm as the distance to the underside of the girders was about 60 feet. We thought it might rain by the time the girders arrived, so all the strobes needed to be in plastic baggies to protect them. At this point, I start getting conflicting information from the workers on site regarding what would be taking place when the girders arrived. I was told that traffic would be put into one lane and allowed to pass while the girder is driven up into place, attached to the cranes and readied. 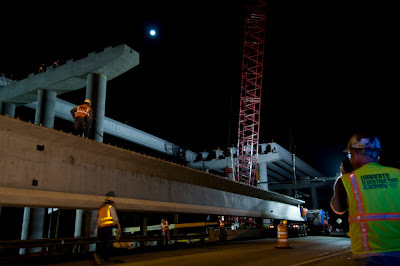 Once the girder is ready to be lifted, all traffic would be stopped until it cleared the highway. That meant I would have to deal with traffic passing in front of my position (the only safe position) I was allowed to be in. I also learned that another "Man-Lites" was going to be brought in to light the area. When this additional light was brought in, it was directed right into my lens! Did I also mention that the strobes we placed and ran tests on would be in the way of the worker movements and would need to be moved. I had planned on some special lighting for this shot only to have the situation change in a matter of moments. I was really looking forward to a more interesting "lit" shot. This is where "Punting" comes in. I want you to see what the placement of the additional "Man-Lite" looked like from my position. I had to find a way to block that light in order to use it's illumination on location. I was able to use my assistant Erik as a "gobo" to block or flag the direct light source from striking the lens. 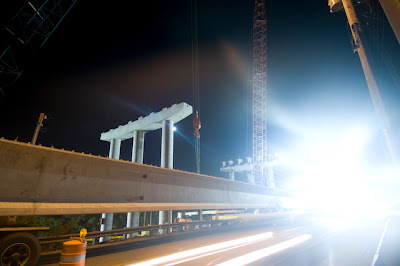 The light Erik was blocking was placed to aid the workers on top of the vertical supports which the girder would be placed not for the photographer! 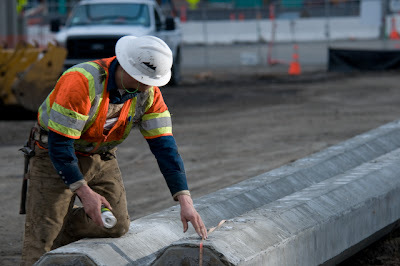 I needed additional lighting on the girder section which was closest to me, so we placed an SB-800 to the guardrail to light that portion of the concrete girder. I also clamped another SB-800 to my tripod leg with an CTB to illuminate Erik talking into a walkie talkie. Here is a sample of the shot as it turned out. As hard as you try sometimes to create something special, thing out of your control take place which require you to quickly change your plans. You just have to make the best of the situation and continue on. We continued to have traffic flowing past our position, here is one of those times. I also wanted to show you this image, the humidity started to climb and condensation appeared on my lens and camera, nothing was going my way! Here are a few other images for the shoot earlier in the day. Just having fun in the studio today. While my computer turns out web pages from my shoot yesterday, thought I'd multi task and shoot a portrait of myself. I placed a SB-800 strobe on a Justin Clamp and clamped it to the softbox frame to soften the effects of a small strobe. I used only one strobe and a Road Rags flag to prevent light striking the left edge of the background. This provided a nice dark area for my well lite face to contrast with. The post processing was done in Lightroom, I selected Preset in the Develop mode called "Cyanotype"
I have got to be the luckiest guy in the world. My wife is a wonderful graphic designer and has recently freed up enough time from her clients to give me a hand. 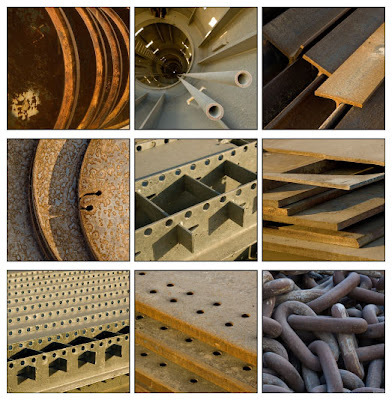 She has produce a new landing page for my industrial work. You can see that page HERE. I have to admit, I was a bit taken back when I got the call to shoot a fashion/product assignment. This particular client found me on the web and I guess by looking at my industrial work, they thought I was a perfect fit? There is a fashion trend in South America right now that involves ribbon bracelets which you tie on your wrist. Your suppose to tie 3 knots while making 3 wishes. When the ribbon ware off or brake off your wrist, your wishes are suppose to come true. My client needed photos of kids and adults wearing these bracelets which are know as Brazil-ets. My day started with young children ages 2 years of age to 12 years. We than moved up to the high schoolers and than adults. I really enjoy shooting subject matter that I don't normally shoot, I think it keeps me fresh and challenged. We must of had 20 or so people in the studio at any given time during the shoot. A few of those where there to try to catch a look at half naked women. Here is a video of the photo shoot.